Transferring in and out of bed can be challenging for many patients, so measures must be taken to help them maintain their independence. The Sidhil Lifting Pole, Strap and Handle attaches securely to the framework of the bed and securely aids patients with supporting their own weight, enabling them to move themselves in and out safely. This has the dual effect of bolstering patient independence while freeing up carer time for other procedures. 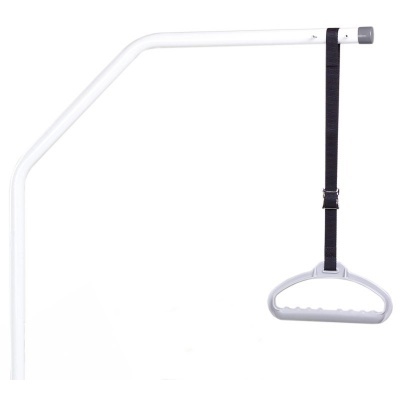 This Grab Handle is simple to attach to the framework of your bed, and can be installed without any tools. It can be clamped onto the bed in seconds and tightened using the hand wheels, providing greater patient independence with little effort by the carer. If a patient requires assistance every time they enter or leave their bed, it can provide a psychological barrier to recovery for the patient and lead to less carer time for other procedures. This Grab Handle can help in both aspects, boosting the patient's sense of independence while freeing up carer time for other tasks. Please be advised that the Sidhil Lifting Pole, Strap and Handle is usually delivered within 1 week of your order being placed. We would advise you to consider this delivery estimation before placing your order. For more information, please contact our Customer Care Team at 020 7501 0592.